IN THE last 20 years, we have become expert communicators. We send and receive information via computer, tablet and smart phones. We communicate so much today that we seldom have time to converse in person. People who worked in the 1980s or earlier remember that it was a time when we communicated a lot less and we conversed a lot more. Conversing is the heart of dialogue and is best done face to face. I define communication as sending information and dialogue as thinking together. Although dialogue starts with communication, many situations need more than just communication to achieve optimal outcomes. When do you need to communicate? Think of what you are doing when you call someone, send a text, read an e-mail or “Google” a topic on the Internet. You are sending and receiving information. You are possibly confirming arrangements, checking on what people are doing, sharing a photo or reading the news. Now think of when we need a dialogue. You might need to resolve a previously unforeseen problem, create a new solution or help a friend deal with a tough situation. If you try to resolve situations needing dialogue by using communication, you usually just make things worse. 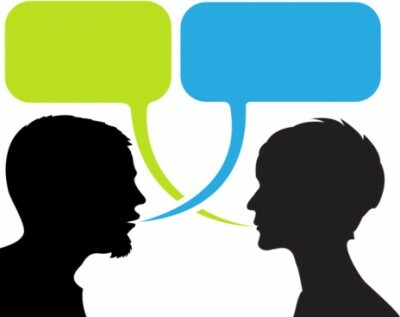 How do you feel when you want to engage in dialogue but others either don’t want to, don’t know how or are not available? Do these responses sound familiar? If it is your boss, you might do what you think is right and realise it doesn’t matter anyway because no one ever checks with you. If it is a friend or family member, you feel alone or ignored and wonder why they don’t care. We are now confronting the implications of having passed our “digital tipping point” — the moment when we spend more than half our waking hours digitally rather than personally connected with others. Think of a typical day. You wake to your digital alarm, check your phone for text messages, turn on your computer, radio, TV or music player, prepare for work, plug in your ear phones and commute to the office, checking your phone or tablet. When you arrive, you say “hello” to a few people, then open your laptop and focus on your work. You probably struggle to keep up with your e-mails in between your PowerPoint meetings and PDF document management. Typically, you take a break now and then to speak with a friend, grab a bite to eat and compare notes on what you learned communicating in the last 24 hours. At the end of the day, you put your ear phones back in your ears and commute home, checking your phone or tablet on the way. In the evening you might watch a movie or television before going to sleep. If this scenario resembles your life, you are well past the digital tipping point and spend much more than half your time digitally rather than personally connected to humans. The explosion of communication in our lives today combined with the nature and complexity of the challenges we face in the 21st century has created a gap between the quality of dialogues we have and the quality of dialogues we need to solve our problems at work, at home and in society. I call this reality “Dialogue Gap”, and in my book of the same name, I describe the origins, implications and suggested solutions for this dialogue gap. Give yourself regular opportunities to be 100 per cent present with the people and environment around you by turning off all your digital communication devices and turning on your eyes, ears and intuition to absorb fully what is going on. Presence is one of five attributes of a good dialogist. The others are respect, expression, suspending and absorbing. Identify the topics in your life that need dialogue and then put together the pieces of the puzzle to achieve optimal outcomes by getting the stakeholders to talk about the key issues in the right way and at the right time and space. Ask stakeholders a lot of questions to explore their understanding, perspectives and feelings for the outcomes you want to achieve. People who are good at establishing a dialogue ask a lot of questions and are alert to answers, considering not only what is said but also how it is said and what is not said. If you must remember just one thing, it is this: if you are facing a difficult situation, whatever it might be, the solution is in the dialogue so stop texting, e-mailing and Googling and instead engage your stakeholders in dialogue. By reverting to dialogue when needed, you begin solving your problems more effectively, become happier and healthier and learn more about your present environment.